The Red Line Transit Project is a proposed 14.1-mile light rail line designed to connect approximately 55,000 daily riders in East and West Baltimore, providing access to employment centers, reducing travel times, and creating thousands of construction jobs. Planning on the $3 billion project started in 2002 with the anticipated start of construction in 2015. Unfortunately, the project is in danger of losing state funding due to a change in political power at the state level and the Governor’s recent announcement that it will not be built as currently configured. As a local affordable housing advocate and developer, I have been coordinating advocacy for the Red Line on behalf of Enterprise Community Partners. Despite the many benefits to low-income residents along the planned route as well as significant construction jobs which will be created, I have been struck by how few of my affordable housing development colleagues were informed about the project. . .
An extensive public engagement process has been ongoing for over 13 years, and in 2008 resulted in a Community Compact signed by over 70 community associations, foundations, government and institutional stakeholders. The Compact articulated the goals of adhering to inclusive hiring practices, sustainable building and design, low impact development principles, and transparency. Unfortunately, only 3 of the 70 signatories were community development corporations. However, the fall of 2014 also brought a statewide election and a new governor, with a major shift in the political landscape. The newly-elected Republican Governor announced at the debut of his term that he wanted to further consider the State’s $2.9 billion investment in this and another light rail project in the state. Suddenly advocates needed to shift strategies and create new alliances. Both fixed rail projects were planned in part to connect minority to majority communities and reduce commute times for residents to job centers with living wage jobs. Along both rail lines, opportunities for new development was rich, especially in neighborhoods desperate for quality affordable housing. During the 2015 legislative session, the affordable housing advocacy slate of issues did not include any advocacy for the Red Line. 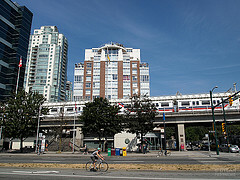 The typical affordable housing agenda of increasing funding for affordable rental projects, targeted tax credits and grants, overlooked the opportunity to link those requests to securing funding for the proposed transit lines. Adding advocacy for the Red Line required more than simply articulating pros and cons because there was not a common baseline understanding of its benefits or the link between creating affordable housing and the need for quality transit which connects that housing to job centers. Through collaborative advocacy efforts, we were able to inform and connect affordable housing developers to equitable transit oriented development advocates. Together, we presented the Governor with a compelling, fact-based report on the jobs and economic development connected to the Red Line. We had hoped that this economic information would significantly inform his funding decision about the project. However, on June 25th, the Governor announced that the Red Line, “as currently conceived,” would not move forward citing cost and downtown tunnel design as fatal flaws. This announcement devastated all who had worked hard to preserve the Red Line, new and long time advocates alike. The bonds that were forged during this collaborative advocacy effort are solid and have already served to provide a more comprehensive approach to pushing back against the Governor with strategies for a regional transportation authority. As affordable housing advocates and developers, leveraging quality transit that connects residents to job centers providing living wage jobs should be a top priority. Housing should not only be affordable to purchase or rent, but should be developed with a view to long term sustainable tenancy of the occupant—i.e., is this housing built in a place where the residents are connected to living wage jobs and other community resources? The cross pollination of housing, transportation, workforce development, and environmental advocacy groups and philanthropic organizations is critical to overcoming entrenched structural barriers to eliminating poverty. Projects like the Red Line in Baltimore and the Purple Line in Prince George’s County, MD, generate opportunities to build job accessible housing along the transit route. Affordable housing and transit advocates in Baltimore hope to emulate the Central Corridor Collaborative created as part of the Big Picture Project in Minneapolis/St. Paul. The HUD, DOT EPA Partnership for Sustainable Communities which formalized collaboration between those agencies to link housing and transit projects while protecting the environment should have served as a best practice example for local governments but also advocacy professionals. Representatives from environmental, workforce development and transit communities should be a part of preparing your advocacy workplan. The Baltimore Metropolitan Council’s Sustainable Community award to draft a regional plan for sustainable development provided forward movement to institutionalize relationships between local housing, transit and workforce development advocacy communities; perhaps the recent release of their final Regional Plan for Sustainable development and its roadmap for implementation will actualize that goal. The next phase of our advocacy for the Red Line depends on it. This was a fine article! So much good info and perspective — and so readable! CDCs need to come to the rail. No humour intended! Best luck on the Red Line! Stewart, thanks so much for your feedback and your recommendation. We have a coalition of folks that is ever expanding and we certainly believe the broader the better. The Greater Baltimore Committee has been a consistent leader in advocating for the Red Line.